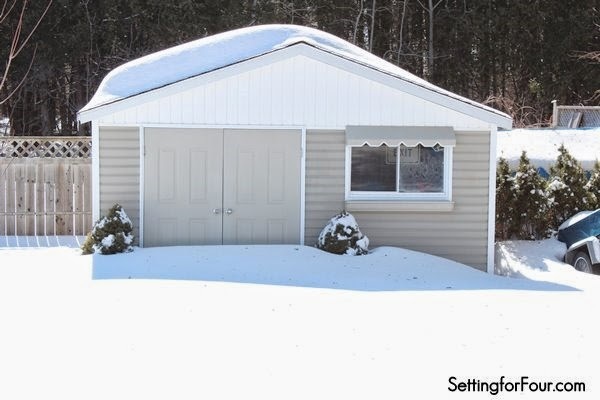 Even though we still have several feet of snow on the ground we are thinking about Spring here and making plans to maintain our yard once the snow melts. We are lucky enough to have a large landscaped front and back lawn with beautiful flower gardens and shrubs, decorative stone landscaping and a large yard area. 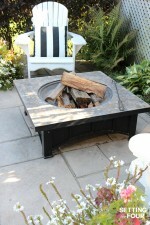 We get lots of enjoyment from our grassy yard and flower gardens… and it adds a lot of curb appeal to our home! It’s important for us to maintain the value of our home with well cared for yards as well as keeping them looking their best as any proud home owner would. To keep our lawn and flower beds looking beautiful, over the years we’ve invested in a lot of garden supplies and equipment ranging from lawn mowers, fertilizer, hedge clippers, insect and weed control, gardening tools and plant pots! 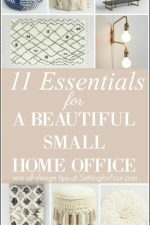 …and it could all become chaotic and disorganized very easily if we didn’t have the proper storage for it all! 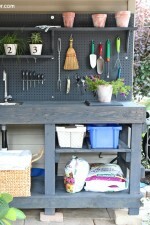 In the spring, summer and fall we want to spend less time working on maintaining our lawn and more time enjoying it – so we’ve come up with some excellent storage and organization ideas for yard and garden supplies. 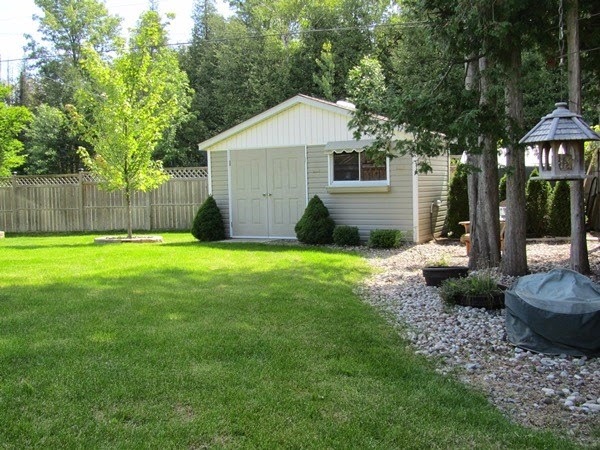 We have the cutest garden shed at the back of our yard….this is where we store the majority of our lawn and garden supplies. It has tons of wall shelves, hooks and shelving units to organize everything. 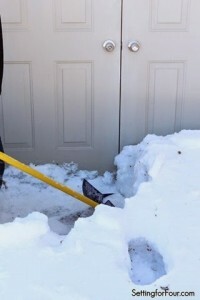 I’d love to show you what I mean but it’s buried in snow right now! Like the true weekend warriors that we are, we attempted to shovel out the doorway this weekend…but we couldn’t open the door due to the huge amount of ice on the ground! So I’ll show you the other space we use to organize our yard and garden supplies. For the front lawn and garden we store the yard equipment in our garage. 1. Wall shelving: Using the vertical space in your storage area adds a lot of room for jugs, bottles, yard tools, yard gloves, you name it! These shelves were super easy to hang. 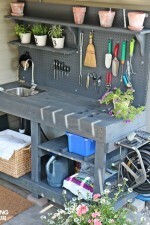 Just attach the metal brackets to the wall and lay a shelf on it! Here we stacked 3 in a row. 2. Freestanding shelves: These require a bit more square footage than wall shelves because they are deeper but they are an excellent way to store gardening boots, watering cans, pails and larger pieces of equipment. This freestanding plastic shelving unit is made from a lightweight yet sturdy plastic material which won’t rust and is easy to hose off. 3. Wall Hooks: We use a lot of these! We store ladders and hoses on these handy wall hooks. The rubberized tips won’t gouge or rip whatever you hang on them too! 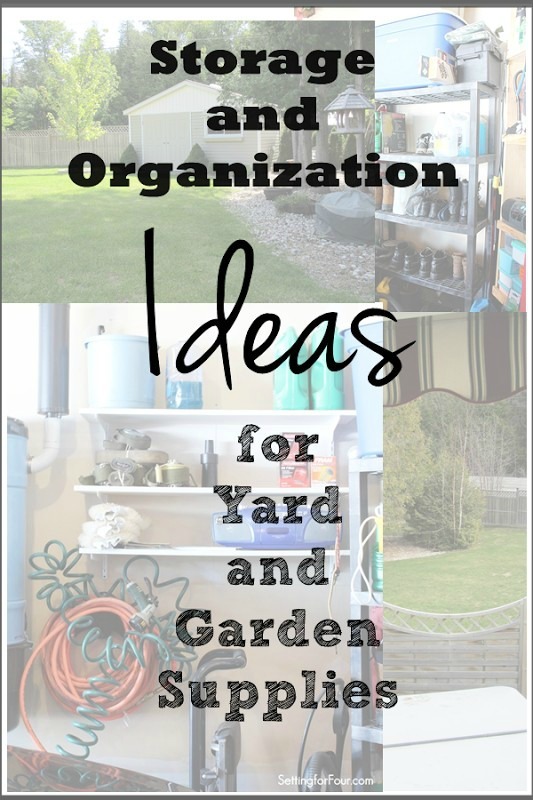 To all of you fellow yard warriors, how do you organize your yard and garden supplies? Are you a lawn and yard weekend warrior too?